The AJ Foyt Coyote Edition is built by Heritage Customs and limited to 500 cars. All cars have custom body panels, custom wheels, and special Coyote badging. The modifications come in many of the standard Mustang factory colors; and many have a custom, color matched supercharger. Black 2008 Mustang AJ Foyt Coyote Edition Mustang coupe owned by Dennis from Altamonte Springs, Florida. More precisely, it's a 50th Anniversary Of Indy Car Racing AJ Foyt Racing Limited Edition 2008 Signature Coyote Edition Mustang #052. Dennis describes it, "This is a rare and highly desired collectible Masterpiece! This is only 1 Of 5 A.J Foyt Indy Racing Mustang Limited Edition Cars in existence, designed by AJ Foyt himself and built by Heritage Customs in Texas! Only 5 of these were ever built! There was an initial plan to build a total of 50 of these cars but the company was sold and thus only 5 were ever built. This special AJ Foyt 50th Year of Indy Racing vehicle was to be exclusive only to Tom Bessett, who was the original owner of Heritage Customs. As a result, AJ Foyt would no longer allow the production of these vehicles once the company was sold. All documentation is included with this vehicle supporting this. Car has been pampered by this original owner, only 730 original miles! A.J. Foyt himself personally signed this car on the dash and provided a certificate of authenticity for this RARE car! This car came with a programmer to boost the horsepower to 600+ to the rear axle and that has never been opened! The car is currently at 454HP to the rear axle as it was originally designed and built. 100% garage kept from day one! V8 Coyote supercharged engine, true ram air hood, rolled & tucked black and red leather interior, plastic still on the carpet! All carpet mats and the carpet in the trunk are black with red and have A.J. Foyt Racing embroidered on them! The console is embroidered with 50th Anniversary A.J. Foyt Racing, metal plate on the dash and under the hood are numbered with AJ Foyt 50th Year Anniversary Limited Edition 052, 6-disc CD changer, and true short throw 5-speed Hurst shifter! Adjustable shocks, chrome AJ Foyt Racing door jams, rims and even the mufflers are chrome! AJ Foyt Racing steering wheel! Everything under this car is color coded; black with all bars painted red! Engineered with precision! The cost of the custom black car cover alone is $1000 and it is included! It would sell for 150k+ at the Barrett Jackson Auto Auction. Own it today for only $125,000! Wow! This car has a 3YR/36K mile bumper-to-bumper warranty. On April 14, 2010, fresh synthetic oil, oil filter and lube were all performed by a certified Ford specialist. Of the 5 ever made, 4 were black and 1 Candy Apple Red. This is the 2nd black one built! What an investment here! Once in a lifetime! Make your dreams come true! Must see today. Call for your viewing appointment of the best and most desirable AJ Foyt Coyote Mustang in existence!! Will go Fast! Do NOT Miss Out!" 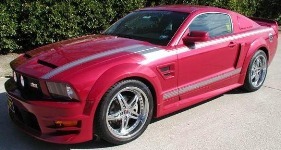 Dark Candy Apple Red 2008 Mustang AJ Foyt Coyote Edition coupe with a supercharged, 4.6 liter, V8 engine. Built by Heritage Customs of Arlington, Texas, the A.J. Foyt Coyote Edition package includes: custom front fascia, rear bumper, fender flairs, side skirts with door caps, rear window louvers, front fender vents and rear spoiler; twin scooped fiberglass hood with Ram Air induction; color keyed mirrors; rear quarter window panel side scoops; A.J. Foyt performance exhaust; black grille with center mounted fog lights; 20 inch chrome wheels and Toyo tires; Coyote striping with A.J. Foyt logos; chrome Billet fuel door; color keyed headlights; Ford engine cover; custom leather seats with A.J. Foyt signature, numbered and signed dash plaque; under hood appearance package; and a Hurst shifter. Torch Red 2008 AJ Foyt Mustang GT coupe with black stripes, a special body kit; window louvers; rear window u-trim; painted mirrors; high flow exhaust, stainless steel grille with fog lamps, custom 20 inch wheels, A.J. Foyt graphics, custom fuel door, drilled and slotted rotors, HP brake pads, Roush cold air intake, Ford Racing suspension, custom A.J. Foyt leather seats, serialized badging, and a Hurst short throw shifter. This AJ Foyt Mustang does not have a supercharger. We have many AJ Foyt Mustangs on this site.